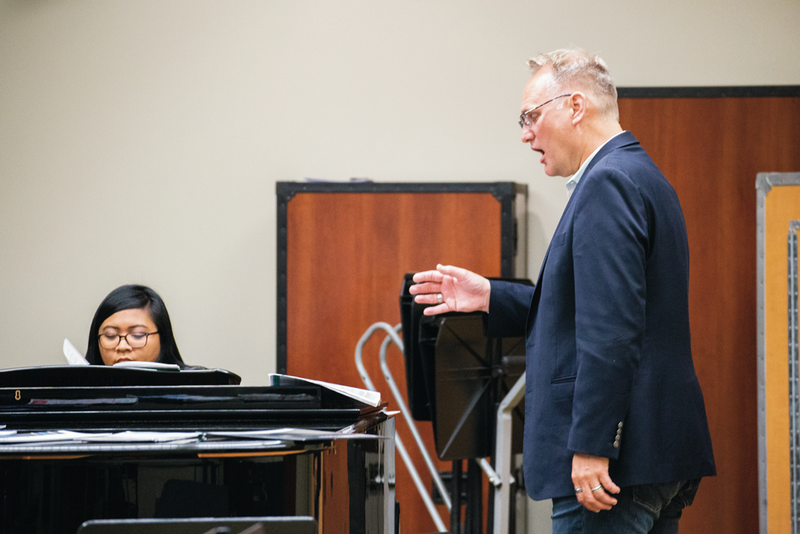 Kristen Vargas | Banner | Steven Dahlgren, assistant professor of music, shares his knowledge on conducting and music education with the high school choir program, Young Musicians. The Inland Empire Musical Arts program has introduced the Young Musicians program at California Baptist University to promote musical development among high school students in the local community. Students from ninth to 12th grades participate in bands such as Honor Symphonic Band, Honor String Orchestra and Encore Honor Choir. Michelle Elliot, Inland Empire Musical Arts director, said she started the music education program in 2016 because of her heart for youth and love for music. CBU’s Shelby and Ferne Collinsworth School of Music became education partners with IEMA in December 2017 to further invest and support the effort. “This partnership encompasses the bringing of students onto CBU’s campus for summer camps and year round music classes to provide a well-rounded music education program,” Elliot said. Students in the Young Musicians Program Honor Ensembles can earn scholarship funds toward their attendance at CBU, with the requirement that students participate in at least one CBU ensemble. Karina Lay, junior in high school and viola musician in the program, said she grew to love music with the help of the program and CBU will be a great fit for her financially in the future. “This program will definitely help me with tuition in the future for CBU,” Lay said. Students are able to learn from multiple musicians with different instruments for diversity and perspectives in their music. “I get help with my sight reading and learning techniques,” Lay said. Miguel Wences, sophomore in high school and violin musician, said the Young Musicians program helped him evolve with various ways of learning as a musician. “I decided to join because I saw it as an opportunity to grow as a musician and help others along the way,” Wences said. Wences said his potential musical future is what influences him to want to continue to play the violin. Young Musicians is hosting an upcoming Winter Concert called “Christmas Bells” Nov. 27 at 7 p.m. in the School of Music at CBU.